I have just finished making assignment 8 for Finding You. It was fun making the photo for this layout. Picture this! Me standing on a small heap of sand and jumping up and down. And then my neighbour Esther lying on the ground and taking photos. And you know what I wasn't jumping that high but it looks like I'm just doing that on the photo! 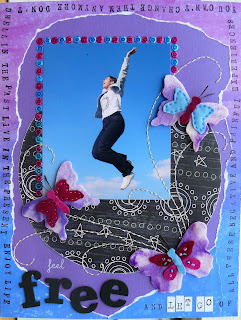 Supplies: pp (Karen Foster, Rhonna Farrer), cardstock (Bazzill), felt butterflies (self made), beads (Blokker), silver thread, wordstamp (Provo Craft), letterstamps (Image Tree), Thickers and rub-ons (American Crafts), Stazon. meid wat mooi zeg. De foto is perfect by de rest van je hele lo. Ik hoop dat je je ook zo voelt!